Tulum offers the perfect combination of total relaxation, tranquility and seclusion, yet fill your day with the many interesting and rich activities in the area. The little town of Tulum is slowly developing to offer various services (like an Internet Cafe for example) phone service, and more. There are several very good local restaurants and a few on the beach in the various properties in the hotel area on the beach that are absolutely wonderful and still very cost effective. The history of Tulum indicates that it was the site of a Pre-Columbian Maya walled city serving as a major port for Cobá. The ruins are situated on the tall cliffs, along the east coast of the Yucatán Peninsula on the Caribbean Sea.. Tulum was one of the last cities inhabited and built by the Mayans, it was at its height between the 13th and 15th centuries and managed to survive about 70 years after the Spanish began occupying Mexico. Old World diseases brought by the Spanish settlers appear to have been the cause of its demise. One of the best-preserved coastal Maya sites, Tulum is today a popular site for tourism. Tulum has two main points of interest. The beach (Playa) site, and the city (Pueblo) site. The city sits off of highway 307 running South-North. "El Pueblo", as referred to by locals, is home to most workers of the tourist industry and where many of the stores, supermarkets, two bus stations, inns, hostels and small hotels are found. 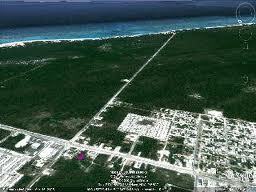 This section of town has a definite feel of existing mostly to cater to the Tulum ruins. Tulum pueblo is indeed a destination for shopping, great restaurants, a modest night life, studying the language at Instituto Chac-Mool Spanish School, booking tours, banking, shopping for food, local vegetables, fruits, cafes, and local flavor. Do not miss it. Tulum Playa nests along the coastline that leads into the Sian Ka'an Biosphere [Ecological Reserve], the Caribbean white sandy beaches to the east, an impressive mangrove & wetland reserve to the south. Tulum Playa embraces many of the fancier, ecological, boutique and spa hotels, and it has a decent to excellent selection of restaurants and night spots. There are also a number of affordable beach front cabana-type lodging locations. Walk the beach and simply step in and inquire about accommodations and rates. You will be surprised and delighted. That's right, this place isn't completely mainstream yet, and that's prefect because you won't find crowded places and you'll experience a better travel. That's why there are so many great Tulúm México vacation rentals with affordable prices and high quality service!